Andi Fuchs wins TriStar111 Split ! The run course will take the competitors through a dense Mediterranean pine forest followed by the historic old town of Split. The run course has three Energy stations. The finish of the race is on the Promenade Riva. "My highlights are winning my age groups 2007 in Frankfurt and 2008 in Wisconsin. Winning the half distances in Linz and Vienna in 2010 - both in new record times - and of course my third place at Tristar 111 Germany in June. But beside those things I am really proud of being an ambassador for Tristar, in my first year as a professional, next to athletes like Chris Mccormack, Lothar Leder, Nicole Leder and Ain Alar Juhanson... 3 years ago I wouldn’t even dare to think about things like that!" After 60km on the bike, if Birngruber is still leading, Andi Fuchs is now on the second place 3min behind and Podsiedlik is third 4min behind. Exciting fight for the podium! Birngruber is still leading after 40km on the bike. Dejan Patrčević and Podsiedlik came 3 min behind and will try to catch this young Austrian athlete. Sport has always been the main focus in Andreas Fuchs life. As a child, he practiced in athletics and became state champion in cross country. At 20 he made ​​his first marathon in a time of 3 hours and 4 minutes. At 21 he moved to Styria, where he still lives. In 2000, Fuchs first saw a report on the Hawaii Ironman on television and the decision was clear: "I would become a triathlete." Through hard work and iron discipline, he improved from year to year and finally was crowned two-time national champion of the Ironman distance. Andreas Fuchs is not a man of quick success. Its successes are the result of hard and continuous work, its development over the past 10 years, and his steady improvement in small steps shows his absolute credibility. The first participant after km20 on the bike is #68 Christian Birngruber. The Bike course begins right at the end of Marshal Marmont’s street – the participant ride through the modern parts of the city towards the city exit. The course is quite difficalt for competitors and well observable for spectators. The competitors will discover picturesque villages with breathtaking views over the Adriatic. TriStar111 Split 2011 is about to start in 10 Minutes. 85 individual athletes will compete in the new Triathlon format focused on fun, environmental protection and social responsibility. 4 male professionals will be swimming 1km, cycling 100km and running 10km and trying to win today's race. The team race will start at the same time as the individual athletes, and we'll find out at the Finishline if the teams will manage to make up the difference. 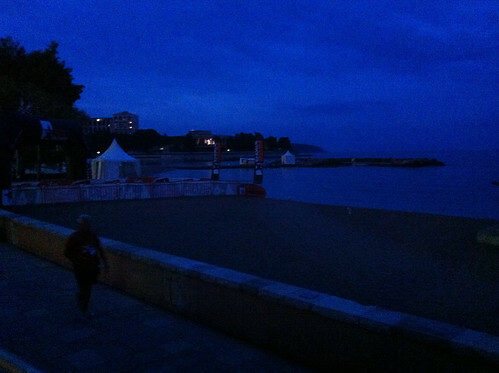 Good morning Split - it's Race Day! It's a great morning here in Split after a quiet night. The bike park opens in 30 minutes ago for the 111 athletes, and they will pump their tyres, prepare the bikes and get ready for the race while wishing each other a good day. We're looking forward to an exciting race with the impressive race course we'll have, and it will certainly be an exciting day, also here on TriStarLive.com. Thanks for being here! 2 days for the inaugural TriStar Split! Sports played in Philip's life has always been a central point, however, it was denied him in his youth in a long time to realize what he is should. With consummate his 15th year he chose to swim with the "Vienna Dolphins club”. But 2 or 3 training in a week was not a difficult challenge for him, that why Philip start running and cycling. His swimming coach push him to the Triathlon and by a happy coincidence met his current coach Mag.Gerald Dygryn, with whom he works since November 2005. Philipp finished his first marathon in 3h30min with just 5 months of preparation. "It was an important moment for me, since that moment I know: “I'm going to be a endurance athletes. " Philipp Said. Here at TriStar111 Split 2011! In the next two days, TriStarLive.com will be covering the TriStar111 in Split, Croatia on 17/18 September 2011.